(PRLEAP.COM) November 17, 2014 - Tuscaloosa, AL - Southland Benefit Solutions announces coverage, effectively immediately, for a periodontal medicament carrier, an innovative tool used to deliver medication below the gums. Southland is the first carrier to announce the coverage decision in a move to position the company as a benefits leader. This decision signals the company's commitment to provide comprehensive solutions for treatment and wellness. A periodontal medicament carrier, best known as a Perio Tray® (Perio Protect, St. Louis, MO), places medication deep into periodontal pockets, the space between teeth and gums that can harbor bacteria. In healthy gum tissue the pocket is 1-3 mm deep. When the pocket becomes infected, the space can exceed 3mm, depths almost impossible to clean with toothbrush, rinses or floss. Signs of infection and gum disease include bleeding or inflamed gums, tenderness, swelling, foul odors and longer appearing teeth. Gum disease is prevalent in the US. The Center for Disease Control estimates that 47% of Americans have periodontitis. Millions more have gingivitis. The seriousness of the numbers are compounded by the associations between gum disease and systemic diseases like cardiovascular disease, Alzheimer's, and diabetes. Perio Trays® are proven to deliver medication to fight infections. They have an internal peripheral seal fabricated to place medication deep into pockets. Patients can only obtain a prescription Perio Tray through a licensed dentist who will develop and monitor a comprehensive treatment plan according to individual patient conditions. Southland expects that research, showing improvements in pocket depths and bleeding conditions with Perio Tray delivery, will translate into both better treatment outcomes for patients and a reduction in long-term health costs. In a July 2014 survey of dentists with extensive experience prescribing Perio Trays, conducted by Perio Protect and Actuarial Worksite Marketing, surgical costs were reduced by 43%, extractions were reduced by 35%, repetitive procedures to clean teeth below the gums were reduced by 32%, and patient satisfaction was 100%. Within the competitive marketplace of dental insurance, Southland competes by identifying effective new technology that improves patient health and decreases costs and by putting beneficiaries first. For additional information on Southland Benefit Solutions visit southlandbenefit.com. 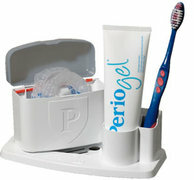 Perio Tray® information is available at PerioProtect.com.